Elle18 Color Pops Matte launched 20 vibrant shades at reasonable prices. They are enriched with colours and moisturizer which will hydrates your lips and long stay pigmentation. They provides nourishment to the lips and at the same time lovely colour to the lips. 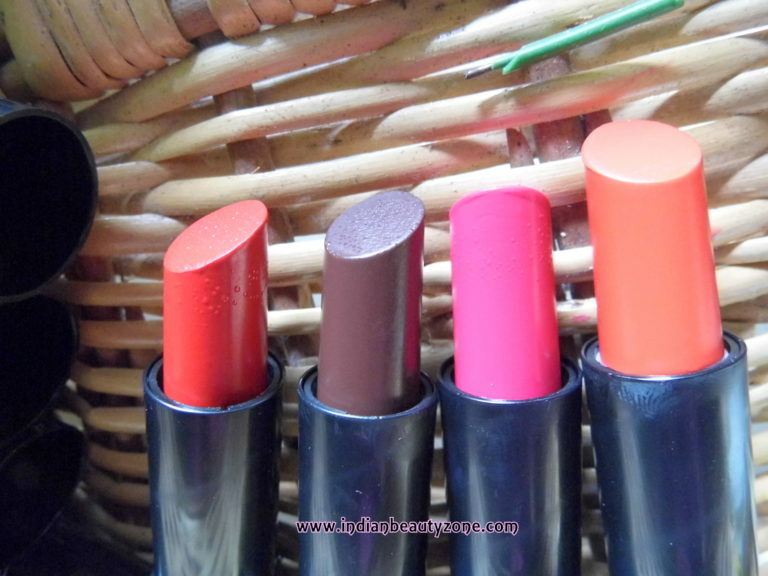 Enjoy the funfull colours with Elle18 Color Pops Matte Lipsticks. The lipsticks comes at usuall Elle18 black lipstick packages (and it is bit boring). It is sturdy enough for travel purpose. 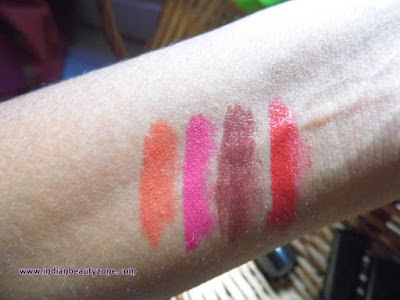 I am reviewing Rose Day, Lets Tango, Selfie Red and Chocolate Day... one more shade called Deep pink which came as damaged and the lipstick was broken, so couldn't swatch or take picture of that. So, these four shades are awesome and bright as well. I personally likes Rose Day and Selfie Red lipsticks. They are common shades for all Indian skin tones. Chocolate day is not a choice of shade for everyone, because it is a dark brown shade which is not common but still some may like it especially fair toned girls. The Lets Tango shade is an Orange shade again not all girls will like it. But the shade looks beautiful when applied on the lips. The other two shades are very beautiful which suits for my medium skin tone very well. Rose day is a beautiful pink shade which looks deep and bright at the same time, the Selfie Red is an gorgeous red with pink hue. 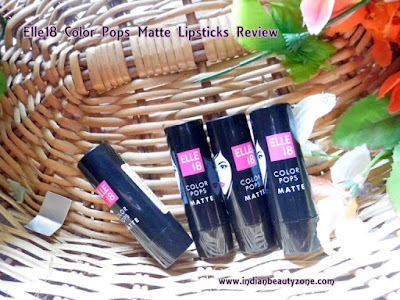 When comes to the pigmentation there is no doubt these Elle18 Color Pops Matte Lipsticks has an awesome pigmentation that gives intense and immediate colour to your lips. It stays better for its price tag and we can't expect more than that from a 100rs lipstick. It stays more than 3 hours also it does give a slight lipstick tint after it disappears from the lips which looks nice. The smooth texture and hydrating power of this lipstick makes this lipstick to wear comfortably and easily at any time. Overall Elle18 Color Pops Matte Lipsticks are good and beautiful launch. 20 shade collection to choose. user and travel friendly pancaking. 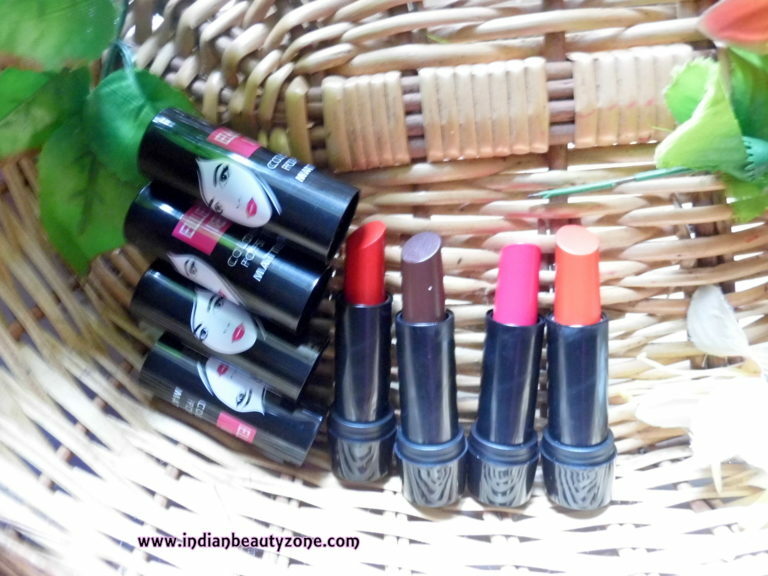 Elle18 Color Pops Matte Lipsticks are beautiful and awesome collection to try out your every favourite shades with an affordable price tag. This is a chance to play with colour on your lips.